The Virality, Engagement scores and Engagement Rates aren’t actually provided by Pinterest but are calculated for your benefit using the Pin, Repin, and Follower data that Pinterest provides. Each of these can be used for benchmarking your own growth week over week by looking at the last 7 days (the bold number on top) vs the 30-day Avg. You'll find these in both Brand Profile Performance and Board Insights. Helpful Tip: Hover over the little blue "?" to see exactly what each graph means in case you forget! 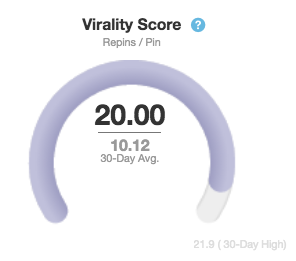 Virality Score is measured as Repins divided by Pins. Your Virality Score represents how many Repins per Pin you get on average- this lets you know if your content is performing well on Pinterest. The bold number above is the all-time number, so we’re dividing your total number of Repins by your total number of Pins. If you are looking at Board Insight's Virality, you are seeing the total number of Repins of the Pins on that board. This score isn't capped, so reach for the stars! 2. Engagement Score can be found by taking the Virality Score, divide by Followers (and then multiplied by 1,000 for a more tangible number). This number is a measure of your audience's Engagement with your Pins, giving you insight into how much interaction your Pins are receiving from each follower. 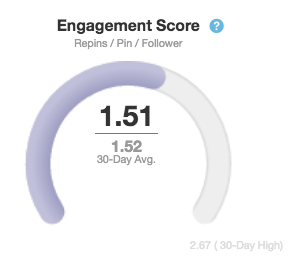 If you are looking Board Insights Engagement, you are seeing the total of Repins divided by Pins divided by Followers of that Board. This score isn't capped, so reach for the stars! Expert Tip: Use Virality and Engagement Scores to cross reference against the whole profile to see how individual boards are performing. 3. 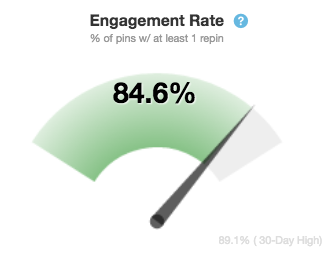 Engagement Rate is measured by counting how many of your Pins have at least one Repin vs. those that have no Repins (represented as a percentage of the whole). It's a simple way for you to see how well your content is resonating with your audience. This rate is based out of 100%, so the goal here is to get to 100%.